Free Screen Snapshot Editor is not only an image editor, but it is also intrinsically a free screen snapshot capture and sharing application. It can capture, edit and share the screen capture. There many free screen capture applications on the Internet, however, not all of them have a buddle editing tool for editing snapshots. Free Screen Snapshot Editor has an editing program embedded in the application and it can edit screen snapshots immediately after capture. Free Screen Snapshot Editor is free to download and install. After starting the application, it will run in background on the system tray. To capture the screen, you can click the icon on the system tray to activate the menu as displayed bellow, or use the hotkeys of the application. If you need to capture a part of the screen, select Capture region or press the key PrtScn. If you want to capture a displayed application window, please select Capture window or use the hotkey Alt + PrtScn. To capture the full screen, press Ctrl + PrtScn. If you select Capture last region, the application will capture the region of the screen that is captured at the last time. This is useful for check the change in the same region of the screen. 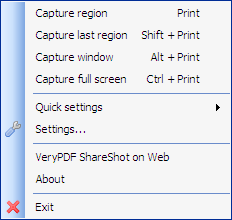 You can set the option to activate the snapshot editor after capture. In the system tray menu, select Quick Settings -> Screenshot destination -> Open in image editor. Then the captured screen snapshot will be directly loaded in the embedded image editor. In the editor, you can draw rectangles, ellipses, lines, arrows and add text comments on the screen snapshot. The properties, such as color, line thickness, and fill color are also customizable. After editing and commenting the screen snapshot, you can click the share button on the Internet. Each screen snapshot will be shared with a unique URL. Free Screen Snapshot Editor supports more functions, and you can click to see the features of Free Screen Snapshot Editor.